Have something other than Whisky at Whisky's! | The Food Hussy! Have something other than Whisky at Whisky's! A few weeks back we picked up my cousin for a weekend visit - it was so much fun! She's from Connecticut and we'd never actually met (2nd cousins) - but she was here working at a church camp for the summer and we were able to have her stay with us for the weekend. It was so much fun! 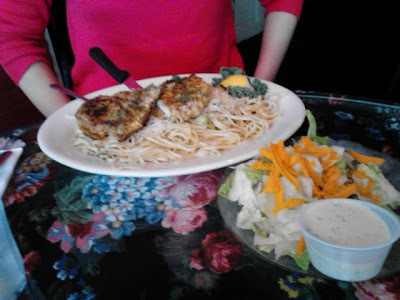 After picking her up we headed to Lawrenceburg, IN for some lunch and came across Whisky's near the riverfront area. 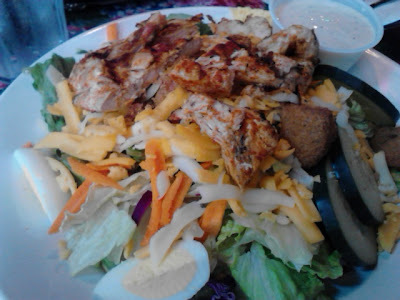 I got the Spicy Chicken Salad and it was really good - it's really large and there were a lot of ingredients. None of it was too unique but it was tasty. Larry got the fish & chips - he enjoyed it - it was a big portion. I tried it as well - it's a light batter which is pretty nice. 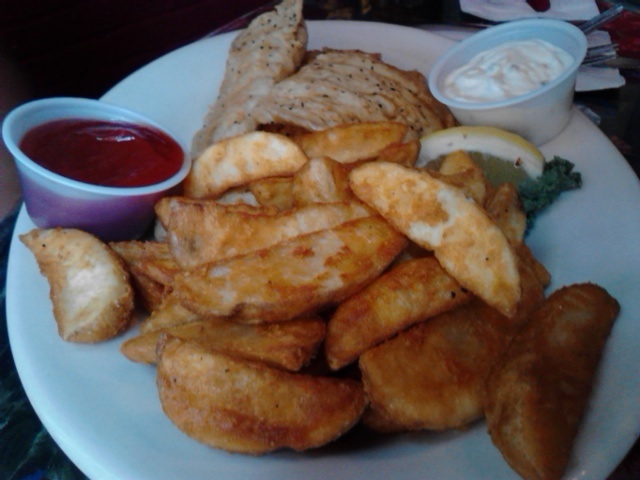 I have no idea what my sister got - but it was a big portion! Chicken and pasta piccata maybe? She ate the whole thing - which is pretty rare. Why Should You Go? Whisky's sort of has that old person vibe (do you see the placemats?) and is fairly dark. Reminds me a bit of the Greyhound Tavern in NKY. The prices are fine - it's about like a run-of-the-mill chain. There really wasn't much memorable about Whisky's but if you're passing through - it's not a bad option.